Chainsaws not only grow more useless when their blades become dull and worn, but it can also be extremely dangerous when this happens. If you own a chainsaw, you should know how to handle it not only when it’s sharp enough to be used, but also how to refurbish every part of it once it becomes dull. This article will explain how to sharpen a chainsaw. The chain is one of the most important elements of the chainsaw as it is a moving part that can be easily seen as replaceable. And sure, there will come a time when it will be inevitable to replace the chain of your chainsaw, however, until then, you should know how to take care of it and maximize its lifespan. There are of course electric chainsaw sharpeners but these are relatively expensive especially if you only plan on using the saw a few times per year. For this kind of user knowing how to file the chain will suffice. One of the best advices in regards to sharpening your chainsaw is to use it in the most responsible way possible. Handling a chainsaw doesn’t just entail knowing how to saw through something, but also what can be sawed through with it. Using the chainsaw on material it is meant for is the first step toward the long life of your machine. So before we get into how to sharpen your chainsaw, we would like to advise you that taking care of it the right way is the first thing every chainsaw owner has to learn. Yes, you own a chainsaw, but did you get all the other equipment you need in order to be a responsible chainsaw owner? Safety glasses, chainsaw pants and a good pair of working gloves are there to protect you from debris that flies while using your chainsaw. These items are not used to sharpen your chainsaw, but should be part of your chainsaw equipment. The other important thing here is the chainsaw file or rotary grindstone. Either one of these items is needed in order for you to sharpen your chainsaw like a pro. But not every kind of file or grindstone is suitable for your chainsaw. Learn about your chainsaw’s gauge and get the right tool for it. Some chainsaws can be equipped with different kinds of chains, so find the features of the chain you want to sharpen, and get the right tools for it. Before you start sharpening the chain of your chainsaw, you must clean it. If you use your chainsaw a lot, this should be standard practice whether you want to sharpen it or not. As we mentioned before, the chain is the moving part of your chainsaw, so any kind of cluster that might be in there can reduce the lifespan of your chainsaw or, in the worst case scenario, endanger the person using it. Before you start sharpening the chain on your chainsaw, you must find a safe place to do it. If you have a work bench equipped with a vise, then you won’t have any problems. Clamp the chainsaw with it and you’re good to go. If you don’t have this kind of equipment, find a way to get your chainsaw stable so it doesn’t move when you start sharpening it. Once set, the chainsaw needs to be checked one more time. Look closely at your cutters and find the one that stands out. Most chainsaw chains have a leading cutter (it is usually smaller than the other ones on the chainsaw). If you can’t find the leading cutter, or if the cutters all seem to be the same on your model, determine where you want to start your sharpening so you won’t lose sight of your process. Now that you’ve found your starting point, you can start your sharpening. Get your file and lean it onto the first cutter. Look at the angle the cutter is positioned in and get with your file as close to that angle as possible. Cutters on chainsaws usually have an angle of 25 or 30 degrees, but you should use your eyes to determine what angle is right for your model. If you’ve done everything right so far, you should be standing in front of a well secured chainsaw and with a file (or grindstone) in your hand, lean the cutters in the right angle. Once you’re set to go, carefully slide your file across the surface of the cutter. Watch if the cutter is being sharpened at the right angle and adjust accordingly. The first cutter is always the hardest one, especially if you haven’t done it before. Slide your file across the face of the cutter and see if it gets duller or if it gets pointier (sharpened). It’s easy to tell if you’re doing it right or wrong, so don’t worry. If your angle is not good, you will notice right away and you can adjust your file. Get the hang of it on the first cutter before you move on to the next one. Once you get the hang of it, all the other cutters are going to be much easier to sharpen. Once you’ve successfully sharpened the cutters on one side, turn the chainsaw around and start doing the same with the cutters on the opposite side. Turning around the chainsaw is better than trying to move yourself around it, since you’ve already got a hang of the sharpening process from where you’re standing. Moving around and changing your position could break your concentration. After you’ve sharpened your chainsaw chain, it’s time to oil it and check the tension of the chain. 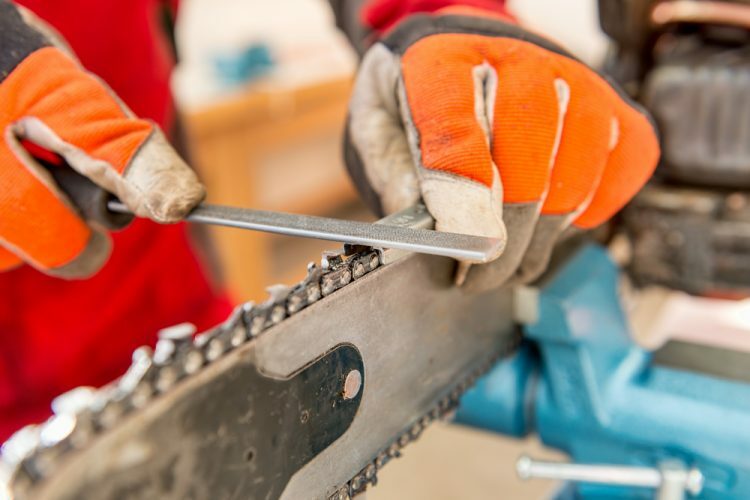 Keep in mind that sharpening is a process of “peeling off” parts of your chainsaw chain, so we would recommend doing it only when absolutely necessary. As we said in the beginning, chains of chainsaws are somewhat replaceable parts, so don’t think about it as something that has to endure everything you put in front of it. Check your chain’s tension after the sharpening and you’re good to go cutting.